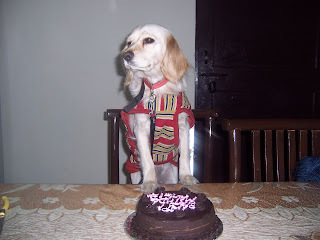 Two years back on Jan 18,2008 Maggie came into our home and hearts. I still remember that day. 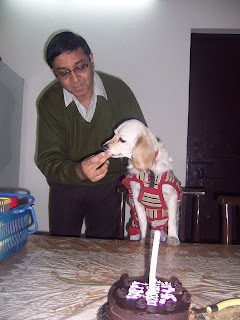 Upasana declared that she has selected a small little cute puppy and will bring her home. It was a very cold day. Maggie was shivering with cold and looked very sad. I told Geeta that she is upset as she is away from her mother. Geeta looked at small kid away from her mother for first time and felt motherly love. She took maggie into her arms and started crying with joy. That night none of us slept properly. We were checking Maggie after every few minutes. Our life is no longer same. She prefer sleeping on my chest with my arms covering her body. 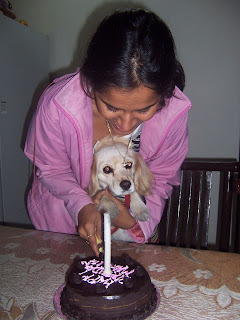 For last 2 years, she is the source of unconditional love and affection in our family. She is popular in our neighborhood with all kids. She is invited in all birthday parties. All small children in our locality who used to call us "Taya Ji and Tai Ji" now call us "Maggie ke Papa and Maggie ki Mummy". She is real Joy-n-Freedom for us. We wish her a long and happy life. Happy Birthday to Dear Maggi from all of us. Nice to see u people celebrating her birthday. Truly wonderful! It reminds me of my family! I would be truly honored if you gave your poetic advice on my blogs of poetry and follow them if you like. If you found my poetry interesting I would love it if you followed my blog of Idealism and justice.